Few studies have examined the interactive effect of intra- and extra-individual vulnerability factors on the trajectory of social anxiety in children. In this study, we examined the joint influence of familial vulnerability (i.e., parental social anxiety) and child biological stress vulnerability (i.e., cortisol reactivity) on trajectories of social anxiety. Children (N = 112 (57 males), M age = 8.14 years, S.D. = 2.25) were followed over three visits spanning approximately three years. 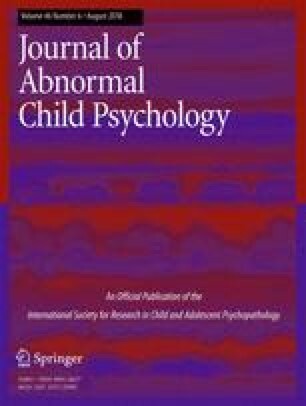 Parental social anxiety was assessed using the Social Phobia and Anxiety Inventory, children’s behavior and salivary cortisol reactivity were measured in response to a speech task, and children’s social anxiety was assessed at all three visits using the Screen for Child Related Emotional Disorders (SCARED; Parent-report). A growth curve analysis was used to examine trajectories of child social anxiety as predicted by children’s cortisol reactivity and parental social anxiety, adjusting for covariates. We found a significant interaction between parental social anxiety and child cortisol reactivity in predicting child social anxiety across time. Having a socially anxious parent coupled with heightened cortisol reactivity predicted the highest levels of child social anxiety, with scores that remained above clinically significant levels for social anxiety across all visits. Children with familial risk for social anxiety and who also exhibit high stress-reactivity appear to be at risk for persistent, clinically significant social anxiety. This highlights the importance of considering the interaction between both biological and contextual factors when considering the development, maintenance, and treatment of social anxiety in children across time. This research was supported by an Ontario Graduate Scholarship (OGS) and a Canadian Institutes of Health Research (CIHR) Doctoral Award awarded to KLP, and operating grants from the Ontario Mental Health Foundation (OMHF) Grant awarded to CEC and from the Natural Sciences and Engineering Research Council of Canada (NSERC) and the Social Sciences and Humanities Research Council of Canada (SSHRC) awarded to LAS. CEC’s participation was supported by the Jack Laidlaw Chair in Patient-Centred Health Care. We would like to thank the many children and their primary caregivers for their participation in the study. We would also like to thank Lindsay Bennett, Diana Carbone, Sue McKee, Renee Nossal, and Matilda Nowakowski for their help with data collection and coordinating the visits, and Alexander Greenberg, Annie Mills, Jhanahan Sriranjan, and Anna Swain for their assistance with video coding. Dr. Charles Cunningham developed the Brief Child and Family Phone Interview (BCFPI) used in the present study. All procedures were approved by the Hamilton Integrated Research Ethics Board. Parental consent and child assent were received from all participants.